On October 6, 1941, Act 35, SLH 1941, appropriated $5,000 for an airport in Lahaina. Due to the onset of World War II, the funds were never expended. 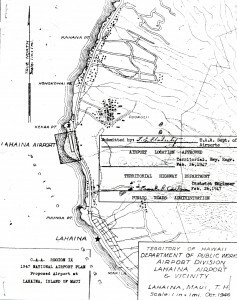 In 1947 the Territorial Superintendent of Public Works again proposed construction of a Class I airport at Lahaina. The proposed airport was to be located at Hanakoo Point three miles north of Lahaina. For most of the residents of Lahaina the port of Kahului and Maui Airport were approximately 45 minutes distant by automobile. “It is believed there is unusual justification for the proposed airport,” reported the Superintendent of Public Works. “Although large aircraft could not be accommodated several non-scheduled operations would undoubtedly give the district the benefit of competitive service in smaller planes, thus residents could reach Honolulu in the time now required to drive to Maui Airport. “The site is ideal as an emergency airport near principal lines of flight and for the protection of single-engine planes experiencing difficulty during channel crossings. In December 1940, the Territory filed an application with the CAA under the 1940 National Airport Act for an allocation of funds for the proposed airport but on account of war conditions there was no further action. 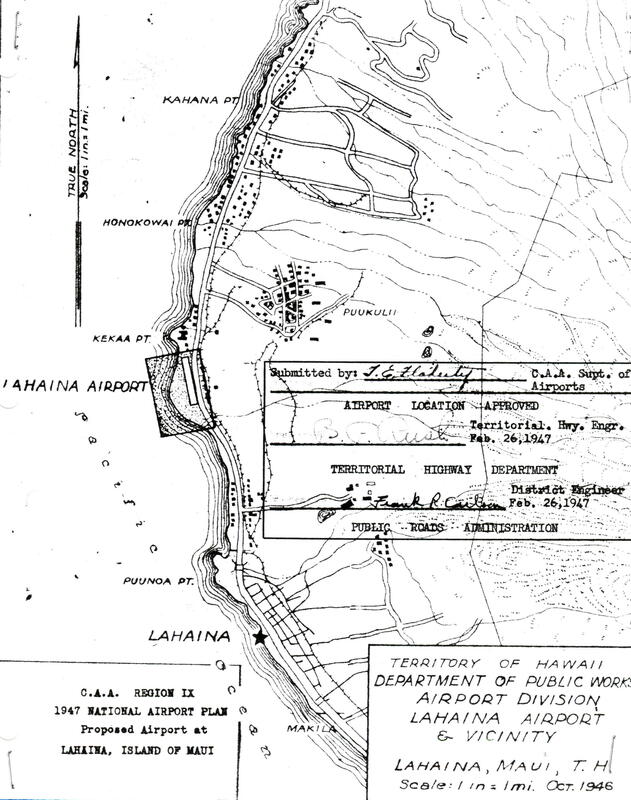 The CAA Region IX approved the proposed airport at Lahaina as part of the 1947 National Airport Plan. No further action was ever taken by the Territory to construct the airport.